Today, a plague desended!! We knew they would find us, sooner or later and today they found us with a vengeance!!! To what do I refer? Well, it's those greedy old grackles that ate us out of house and home up at Cape May Court House last winter. At that time, we were troubled by a flock of some 300 birds, but this time that seemed like a mere trifle! OK, we like them really, it's just that when they arrive at your feeders, it costs you a flippin' fortune! Having noticed all these birds at the feeder, I looked outside to see how many had descended on us this time and found myself spending an hour photographing a real avian spectacle. Indeed, there was so much going on out there that I could just so easily have been on the Serengeti! Brown-headed Cowbirds, bathing in puddles in the road left by the melting snow, started a trend that others soon followed. Common Grackles, with their staring pale eyes join the cowbirds, along with a Red-winged Blackbird. Common Starlings, Common Grackles and Brown-headed Cowbirds. I like this picture not because it shows the birds well (it doesn't!) but because it just shows the madness and mayhem that ensues when birds throw themselves whole-heartedly into a mass bathing session! Walking down Bayshore Road, I soon found that this flock was to leave our old party of 300 in the shade! Common Grackles massed across the road - and left this driver not knowing which side to drive down it seems!! Sun on the backs of the Common Grackles picks out an array of blue, purple and bronze sheens as the birds twist and turn in the air with the passing of every car (and photographer!). The birds along Bayshore Road gradually worked their way further off from our house, so I walked back and checked the fields along New England Road. Here, even more Common Grackles were steaming through the area and I reckoned some 1500 Common Grackles were in the vicinity of our house - but there was more! Common Grackles tend to prefer the vicinity of trees and generally stick to the edges of fields, or even feed on the woodland floor. The larger fields along New England Road were avoided by them, but the air was still full of birds here and a closer look revealed that this was a large flock of Brown-headed Cowbirds and Red-winged Blackbirds. And the male Red-winged Blackbirds really presented an awesome sight with dazzling red splashes of color flashing from their gaudy epaulettes. This picture shows just a small part of the flock of some 500 Brown-headed Cowbirds and 1000 Red-winged Blackbirds feeding out on the fields - to add to the 1500 Common Grackles already seen! 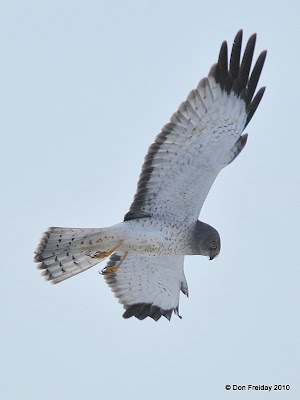 At least three Red-shouldered Hawks were along Bayshore Road, all calling noisily and seemingly having helped themselves to the bounty before them. I also saw a male Merlin shoot through the flock at one point, while several American Crows were getting in on the action, harassing the raptors and stealing scraps. Over on New England Road, three Red-tailed Hawks were following the flocks and I watched two of them having a real set too, rolling around and fighting over a dead Common Grackle (though too far off for pictures sadly). One more, just like the Serengeti, nature's clean up gang were on hand to tidy things up once everyone else had moved on! At least 20 American Black Vultures and eight Turkey Vultures were hanging around the scene, knowing that there would be some pickings to polish off at the end of the day. These guys were biding their time on a house roof. Well, you never know what's going on outside if you don't go and look and the sight of at least 3000 birds clean-sweeping the area was pretty amazing, especially with all the predator stuff going on as well. In addition to all this, a passing flock of 13 American Pipits on Bayshore Road was a nice bonus, as was a group of at least five Eastern Meadowlarks feeding in the field along New England Road. A nice way to round off the year!! HERE'S TO THE NEXT ONE!! Well, if you care about your year list, you are about out of time. . .eBird says 328 species were found in Cape May County in 2010, and that list does not yet include the Varied Thrush or Black-capped Chickadee. Which two, by the way, lift the county all-time cumulative list to 422. With a tiny bit of time yesterday, and slightly more today, I wondered around the bayshore looking for. . .what else, birds. Cape May County’s first recorded VARIED THRUSH was found on private property in Goshen on Friday December 24th, 2010. It has not been seen since. A BLACK-CAPPED CHICKADEE was located at a private feeder on Sunday December 26th, 2010. A GREATER WHITE-FRONTED GOOSE was found in the small field between Seagrove and Sunset Avenue in Cape May Point on Tuesday December 28th, 2010. A CACKLING GOOSE was observed flying south across the Delaware Bay with a flock of Canada Geese on Tuesday December 28th, 2010. A LINCOLN’S SPARROW was seen at the entrance to Cape May Point State Park on Tuesday December 28th, 2010, and was last reported there on Wednesday December 29th, 2010. 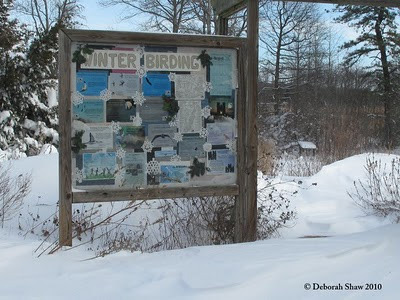 The Cape May Birding Hotline is a service of the New Jersey Audubon Society's Cape May Bird Observatory and details sightings from Cape May, Cumberland and Atlantic Counties. Updates are made weekly. Please report sightings of rare or unusual birds to CMBO at 609-884-2736 609-884-2736 . Sponsorship for this hotline comes from the support of CMBO members and business members, and should you not be a member, we cordially invite you to join. Individual membership is $39 per year; $49 for families. You can call either center to become a member or visit. Become a member in person and you'll receive a FREE gift (in addition to member discounts in the stores). As to be expected, a number of unusual and out-of-place birds have been found during the past few days following Sunday's blizzard. Highlighting the show has been a Lincoln's Sparrow near the small parking lot at Cape May Point State Park. This bird was found by Chris Vogel yesterday, and continued today. I understand that this/a Lincoln's Sparrow was also seen near the start of the State Park boardwalk on December 16. [Lincoln's Sparrow at Cape May Pt. State Park yesterday. Clay Sutton sent along a note, mentioning a female King Eider in the company of half a dozen Common Eiders at Stone Harbor Point today. Also in the realm of waterfowl, one of yesterday's more notable events was the exodus of Canada Geese trying to escape the snow. It was difficult to look up without seeing a flock of geese overhead at times yesterday afternoon. As an added bonus, a Cackling Goose was among one such flock over Reed's Beach. Also notable has been the large number of American Pipits throughout the area. Non-snow covered patches of fields, large lawns and beaches are great places to find the species right now. A bunch were on the lawns at Cape May Pt. 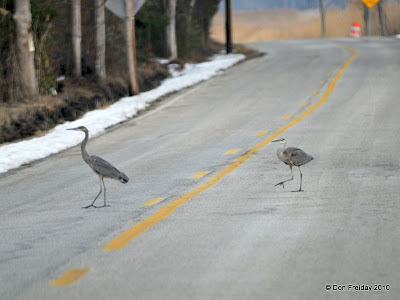 State Park yesterday, and two even landed in my modest front yard along Reed's Beach Road this afternoon. Lastly, as a general note- road conditions continue to improve, but many side streets remain snow covered. Patches of black ice are forming overnight, particularly now that temperatures are rising above freezing during the day. Temperatures will continue to moderate throughout the week, and daily highs will edge toward 50 by Friday. It's a heat wave! It should be a great weekend for birding in Cape May...hope to see you here. Karl Lukens just sent along some photos of the Greater White-fronted Goose behind his house in Cape May from today, apparently a young bird with reduced white in the face and an overall lack of black barring in the bellies (for which these birds are known as "speckle-bellies" or "specks" throughout much of their typical range). Great find, Karl! Greater White-fronted Goose, Cape May Pt. Karl Lukens found a Greater White-fronted Goose in the small field between Sunset Boulevard and Sea Grove Avenue shortly after 10am this morning. It was associating with a flock of Canada Geese. Best viewing would be from Sunset Boulevard, but please use caution in doing so, as I'm unsure what the condition of the road is right now. Karl also mentioned that American Pipits were feeding in the same field. These geese will likely move around to various other spots on Cape Island. 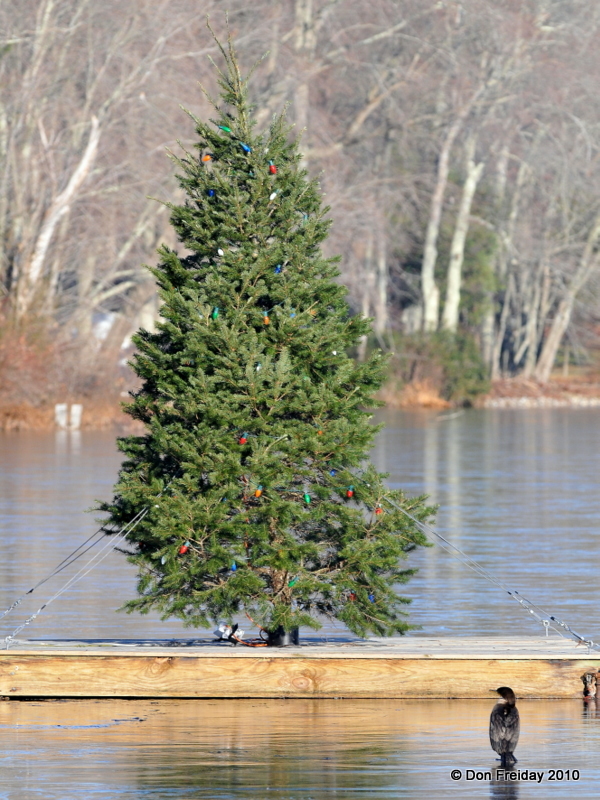 Other places to search include Lily Lake, the Shunpike Road pond, the Meadows, and the field across from Hidden Valley on New England Road. [Winter Birding! CMBO's Center for Research & Education in Goshen this morning. The entire Cape May peninsula was slapped around by an impressive winter storm yesterday, with snow totals ranging from 12-20". Whiteout conditions occurred for a while last night, and blowing and drifting of snow has resulted in drifts up to five feet high in spots. Roads countywide were closed until this morning, and traveling conditions remain treacherous, especially in the very northern and southern portions of the county. High winds and low wind-chills were the name of the game today, and the latest forecast doesn't bring an end to the gusty conditions until tomorrow night. So then what, other than the prospect of hibernation, does all this mean for a birder? Well, a number of things. First of all, as demonstrated during the past few days: watch your feeders! A number of birds that you don't ordinarily see at your feeding station might suddenly appear after a big snowfall. Case in point: a single Swamp Sparrow joined the dozen or so White-throated Sparrows under my feeders this morning, while a Northern Mockingbird was battling a trio of Blue Jays for the rights to the millet I scattered along the adjacent hedgerow. A heated birdbath would also be a valuable item to possess right now. Second, if you're brave enough to head outdoors, make an effort to work grassy roadsides that have been cleared of snow. This is where many birds will accumulate to feed, including American Woodcock, Fox Sparrow and various other passerines. Bare patches of fields might reveal American Pipits, Horned Larks and who knows what else. The biggest advantage is that you can bird right from your car- just do so safely! Third, massive storms such as this one always have the potential to bring in some unusual birds. Satellite imagery this morning revealed an apparent "eye" within our storm as it moved along the upper northeast coast. Wind gusts in excess of 70mph ripped along the Massachusetts coastline and pressure readings dropped to levels usually associated with a category 2 or 3 hurricane. I won't toss up any rarity suggestions in fear of jinxing it, but birders should keep a very close eye on their local patches during the next few days. 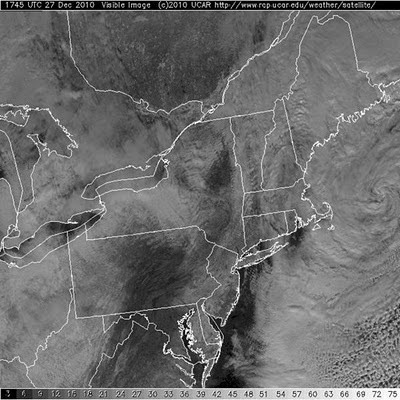 [Satellite view of the storm as it moved up the Northeast coast this morning. Lastly, this weather system might help facilitate a southward push of several northern species. Rough-legged Hawk comes to mind, as does Common Redpoll, which was already making a significant push into the northeast even before snowpocalypse hit. It also wouldn't be surprising to see a sudden arrival of American Tree Sparrows by week's end. Regardless, the most important thing you can do right now is ensure an adequate food and water source for your backyard birds, as they'll be needing it. If you do venture out for some post-storm birding, please play it smart: drive extremely carefully and dress warmly. Good luck, have fun and enjoy the snow! Cape May County's first Black-capped Chickadee! Mike Fritz just sent photos of the Black-capped Chickadee in his yard, which I believe is the first one EVER documented in Cape May County (and certainly not for a lack of trying - they are just plain rare here!). That being said, I bet there are a few more around to be discovered - good luck and keep a close eye on those feeders after this coastal storm! For comparison photos and tips on what to look for, check out Don's ID post below. I'm currently spending the holidays in the chickadee hybrid zone in southern Pennsylvania, and will try to post photos of Carolinas, Black-cappeds, and presumed hybrids from here in the near future. Having spent very almost no time in Cape May during December, I've got relatively little Cape May-relevant to talk about. E.G., I'm in Florida at the moment, ironically wanting to be in the Cape May blizzard watching my feeders. A report just came through of a Black-capped Chickadee at a private feeder in Cape May county, the second county-first species in 3 days if correct (the first being the Varied Thrush). Soooo. . . Let's consider the chickadees. Chickadees make a great bird to remind ourselves that not all indivduals of the same species look the same. On a north Jersey CBC this year I wrestled with a Spizella sparrow that was "too" gray and "too" dull to be a Clay-colored Sparrow (itself a great NJ CBC bird), which means only it was grayer and duller than any Clay-colored I'd ever seen. I decided in the end the bird was "just" a Clay-colored, thanks to insights from friends and examining a variety of photos on the web. So be careful. Shapes can vary wildly with posture. Feathers can wear, so just because it doesn't show much white edging on coverts or tertials doesn't mean it was never there, especially if you are looking at a spring or summer chickadee. 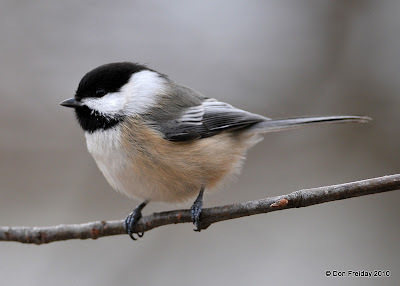 And some individual chickadees show more or less white or buff than others, or more or less ragged bibs, just because. We can also remind ourselves that identifying photos of birds is different than identifying birds. I think these two photos show chickadees in the same overall posture, so the shapes should be comparable. I actually think the photos look very close to what a human eye would have seen, but on the lower bird the highlights are perhaps a bit "blown," e.g. the cheek is a bit too white and we might have lost a bit of color. Maybe. The bottom bird was also in colder light, literally - in snow. 1. Size and roundness of head. 2. Overall "contrastiness" of the bird. 3. Edging on tertials (tough to see on this angle,and perhaps even misleading in these photos). 4. Edging on greater coverts. 5. Size/prominence of white cheek, and degree to which it blends into the nape, or doesn't. 6. Amount of buff on flanks. Something I left off the list of characters is overall size, because you can't do that with separate photos, but I will say that while you couldn't exactly call a Black-capped Chickadee "ginormous," moving to Cape May has made the Black-cappeds look darn big when I stray northward. I'm not sure when I'll next be on a computer, so I invite my co-bloggers to chime in. Perhaps we'll offer a few "quiz"chickadees to challenge the readership. . .
For the second year in a row, heavy snowfall will blanket Cape May in December. Right now, the National Weather Service is calling for 9-17" of snow through tonight. If history is any teacher, this will be hard on quite a few birds around Cape May and the rest of the mid-Atlantic coast, and should force sparrows and woodcocks out to road edges and any other open ground they might be able to find. There's no escaping the ugly fact that you've missed a great bird these days! Word just came straight through to me, via email of a FIRST for Cape May County - and I'm in the UK!! Kudos goes to the well-deserving Pat & Clay Sutton for a superb male Varied Thrush that visited their backyard feeders for the briefest of moments on Christmas Eve. And double kudos to Virginia Retig for being the finder and for spotting the bird from Pat and Clay's kitchen table!! Though some local birders have scoured the area, the bird has not been refound and currently it is presumed to have passed all too quickly through. If the bird should be refound, news will be put out, but for now, birders are asked to respect the privacy of locals over the holiday season. Male Varied Thrush, Cape May County, December 24th, 2010 - nice one Virginia! On Wednesday (22 Dec), Colin Campbell found a Northern Wheatear along the Delaware River in the extreme northeastern corner of Delaware (Fox Point State Park, Wilmington). Tony Leukering and I studied the bird this morning en route to various holiday ventures, and found it to be quite cooperative as it fed in short grass. Though Northern Wheatears are found every autumn in the northeastern US (with birds in this area apparently originating from the Greenland subspecies leucorhoa), it is extremely rare for birds to attempt to winter anywhere in North America. It will be neat to see if this little chap gives it a go! Check out that crazy primary projection beyond the tertials! As a generalization, long primary projection is typical of long-distance migrants, and Northern Wheatear definitely fits into that category. Individuals of the species, even ones of North American origins, typically winter in sub-Saharan Africa! In celebration of the end of another great year at the Avalon Seawatch, here are a few photos from yesterday. Remember, today is the last day of the Seawatch, so get out there and see some great birds (2 Razorbills passed yesterday!). Some of the big stars of the Jersey jetties right now are the Long-tailed Ducks. These gaudy seaducks can be found in many places along the coast and are actively displaying and calling right along shore, providing great views. Male Long-tailed Ducks are fantastic! Between the crazy contrasting plumage, vivid eye and bill colors, long tail sprigs, and bizarre "ow---OWuh-ow" calls that they give commonly both on the wintering and breeding grounds, these are truly stunning birds. Long-tailed Ducks are by no means the only birds displaying along the coast right now. Black Scoters are singing too - listen for an eerie whistled call along the shore, or just look for a goofy-looking scoter in advertising posture. Purple Sandpipers are also present on rocky jetties on the coast right now (along with Sanderlings, Ruddy Turnstones, and Dunlin) - I had the great opportunity to watch and photograph these high Arctic breeders in great light yesterday at Avalon, and managed to see quite a bit of lovely purple sheen on the scapulars and mantle feathers, something I am only rarely able to appreciate in the field. Avalon Seawatch ends tomorrow - visit while it lasts! The Avalon Seawatch wraps up tomorrow - come by and visit with the counters while another great season draws to a close. Razorbills have passed by each of the last two days, and two Glaucous Gulls were also seen today! The seawatch is located where 7th Street in Avalon runs into the seawall. Good luck and have fun - the weather looks nice for tomorrow! 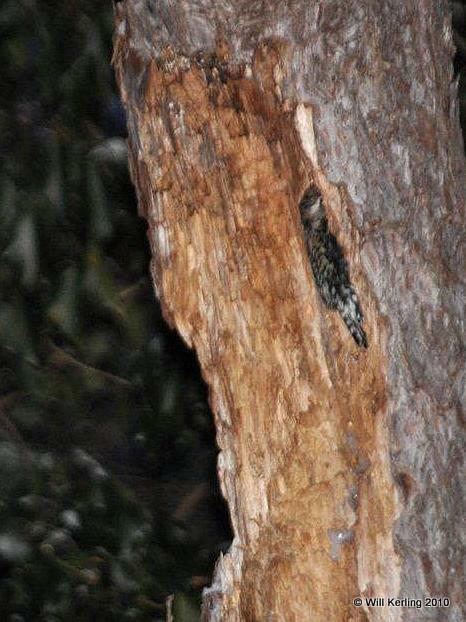 Will Kerling sent the photo above with the following fascinating account: "This Yellow-bellied Sapsucker is tucked into the recess of a dead tree in front of the Northwood Center for the night. The image was taken yesterday evening when it was getting quite dark. I didn't have a tripod so it's a little soft and the depth of field is shallow. "A Brown Creeper tried to settle in right below the tail of the woodpecker and that lasted only a few seconds because the sapsucker rapidly wheeled and chased the creeper away. The Brown Creeper made two very cautiously tries after this incident, but never made another commitment to nestle in. It went elsewhere for a roosting spot." Well, time is up for the Xmas competition - and very many thanks for those of you who exercised your gray matter on this little teaser. Some folks stopped by the store, some entered by phone and most - in this modern world of ours! - by email. Well, we had four winners in the end, and an awful lot of people who only got one wrong and didn't quite make it. So a big CMBO well done to you all, I am amazed how many people can accurately identify those fluffy toy birds!! Chukar - this one caught out almost all the people who didn't quite get the answer right. Most went for Red-legged Partridge, but the overall gray color and narrow neck band with no necklace rules out that species. Incidentally, I did notice after I set the competition that the makers of these toy birds incorrectly call this a Red-legged Partridge - so apologies if you have one and looked at the label! Oriental Turtle Dove - the left hand turtle dove picture shows an Oriental Turtle Dove. This species has larger dark centers to the mantle feathers than European Turtle Dove and the edges of these feathers are a slightly darker brown. In addition, the darker centers merge more gently into the paler margins than in the European species. European Turtle Dove - the right hand (lower) turtle dove picture shows this species; this was my little trap for the unwary, having the two turtle doves of different species. Sad, I know, but we couldn't have everyone winning! French Hen - a lot of people fixated on the breed of chicken, but I only wanted this to species level so I accepted any breed that folks cared to give me! Northern Cardinal - the jury is still out on what a calling bird is (though European Blackbird is the usual answer - calling = collie = coal etc.). With a tilt to artistic license, I decided that cardinals call, and you all got this one right any way! European Goldfinch - ... and two of the goldfinches were European birds, just to add some spice! 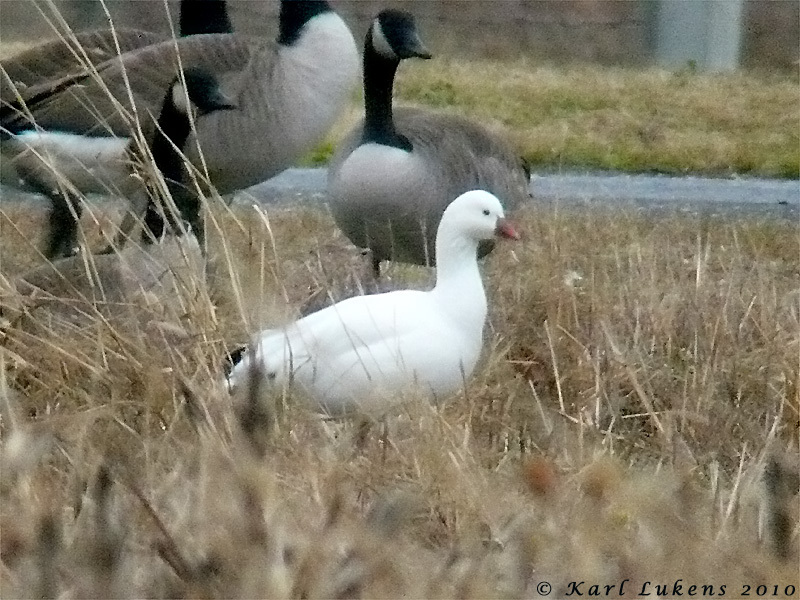 Snow Goose - nice and easy with their pink bills and black 'grin'. Trumpeter Swan - All black bill and black extending around the eye makes the swans Trumpeters, though I had a lot of communication about this one! Once again, well done for joining in the festive fun and if I don't see you in the next few days, have a really cool yule!! Along with many other ducks typically found on freshwater ponds (unless those ponds are too cold to float ducks), this Hooded Merganser was on the open tidal sloughs flowing into Cape Island creek. My CBC party only detected 4 individual cormorants yesterday - 3 Double-crested and 1 Great. Early in the fall season, Great Cormorants make up only a very small proportion of total cormorant numbers, but by the winter, the tables turn and Great Cormorants become much more relatively abundant. I always get a kick out of the structure of Great Cormorants in flight - just look at how this bird's ginormous head and neck combine to make up roughly the same bulk as its entire chest/ body - Double-crested Cormorants usually appear to be much less well-endowed in the head and neck area, and often look downright skinny-necked. A sand-moving operation on the beach at Cape May Point State Park has been attracting gulls as of late. Tony Leukering turned up this cute little first cycle "Kumlien's" Iceland Gull on the beach there yesterday, and Mark Garland found a Glaucous Gull there just a few hours later. It seems like that's a bit of a hotspot for the gulls! For a Pennsylvania boy like myself, where shorebirds on a ridge-and-valley CBC are really the exception to the rule (with the occasional exception of Killdeer and Wilson's Snipe), the number of American Woodcocks around during the winter in Cape May is really spectacular. While I was looking for owls in the early morning hours along Sunset Boulevard, I was surprised to see 12 woodcock zipping by, heading back into brushy hiding spots from their nocturnal foraging exploits. 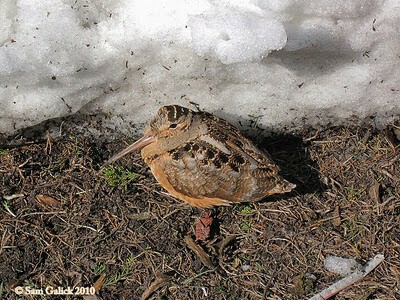 In the evening, Tony Leukering organized a bit of systematic woodcock-watching - different observers claimed stakeouts in good brushy habitat around Cape Island and waited until dusk for woodcocks to fly out to prime worm-hunting territory. In the area around the Rea Farm/ Beanery, Andy Bankert and I tallied 10 woodcocks, including 3 alongside the roads that we got to watch in the headlights as they did their groovy, body-thrusting, foot-tapping walks in search of food in the ground. I was also lucky to run into the individual pictured above during the middle of the morning along Bayshore Rd. Fantastic birds! While they were still around for the CBC, half-hardy birds like Hermit Thrushes and Gray Catbirds seemed to be decidedly down in numbers from just a few weeks ago. It seems plausible that the cold weather we've seen recently might have had a hand in this difference. While there are a number of uncommon birds recorded on the Cape May CBC each year, this one might represent the rarest bird taxon on a global scale that is regularly recorded here. "Ipswich" Savannah Sparrow breeds almost exclusively on Nova Scotia's Sable Island and has a population of only about 6,000 individuals. They winter on the Atlantic Coast, typically in a thin strip of sparsely vegetated beach/ dune habitat along the ocean, and are remarkably different looking from continental Savannah Sparrows, being large and pale, pastel gray with lovely reddish brown details and fine underparts streaking. A nice article by James Rising on the current situation of Savannah Sparrow taxonomy can be found in a recent article of the ABA's Birding magazine (accessible online here). This article helps to explain why Ipswich and Savannah Sparrows are currently considered conspecific, but also describes the level of isolation and how Ipswich are much more divergent than most of the other named Savannah Sparrow subspecies. Anyway, check out Rising's article - it is well worth consideration. Then go out to the dunes and see if you can find Cape May's rarest bird! A ROSS’S GOOSE was found at the Bayside State Prison on Route 47 on Saturday December 11th, 2010, and was last reported there on Sunday, December 12th, 2010. If you try for this bird, scope from the North end of New Road and DO NOT stop on Rt. 47 in front of the prison. A WHITE-WINGED DOVE has been frequenting the feeders at CMBO’S Northwood Center in Cape May Point. It was seen there on Sunday, December 12th, and was last reported on Monday, December 13th, 2010. A female type EURASIAN WIGEON was seen briefly at Lighthouse Pond East in Cape May Point State Park on Saturday, December 11th, 2010. A RAZORBILL was seen sitting on the water at the Avalon Seawatch on Thursday, December 16th, 2010. A LAPLAND LONGSPUR was observed with a small group of Horned Larks at the Cape May County Airport on Saturday, December 11th, 2010. A DICKCISSEL was seen at a private feeder in West Cape May on Sunday, December 12th, 2010. Yesterday both Little Gull and Red-necked Grebe were seen at the Avalon seawatch by Doug Gochfeld, both apparently "hanging out" rather than passing, and both making "count week" for the Cape May CBC! Back in college, about a zillion years ago, I negotiated my way through W.D. Hamilton's seminal 1971 article called Geometry of the Selfish Herd. You'll understand my choice of words if you hit the link. 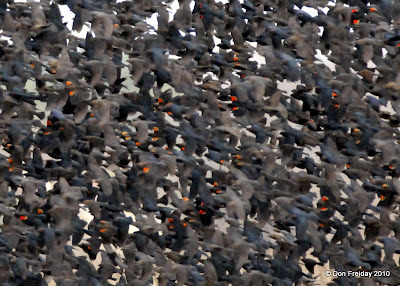 Nonetheless, Hamilton's notion of the "Domain of Danger," and how it is reduced for animals that join flocks, is something we see as birders every time we watch a flock of blackbirds or shorebirds evade a raptor. The gist of the notion is that, by simple math, the more of your friends you are with, the less probable it is that you will be the one that gets eaten! Thus, if you have compatriots surrounding you, your personal "domain of danger" is reduced substantially when a hungry Merlin flies by. That's not to mention the confusion factor, that being the difficulty for a predator to select one target out of a dense, swirling flock. There is an extensive body of literature on the pros and cons of flocking before and since Hamilton, of course, with numerous other hypotheses as to why it all works, but no one has seemed to have figured it out completely. No one, except the birds - because if flocking and "balling up" didn't work, the behavior wouldn't persist! Today I poked around one of the less widely known of the varied ornithological treasures of the Delaware Valley – Tullytown, Pennsylvania. Tullytown, along the Delaware River in southeastern Bucks County, PA, is home to several gigantic landfills that service the greater Philadelphia area. The landfills attract one of the largest concentrations of gulls in eastern North America – hundreds of thousands are present most winters. Since there isn’t much available on the web to help those in the Delaware Valley seeking a fix to the crippling pathology that is Larophilia, I’ve put together a bit of information that might be useful. Tip number one – don’t go on a Sunday. It seems that active use of the landfills shuts down on Sundays and there is much less gull activity in the immediate vicinity. All other days of the week seem to be fine. Like many landfills that attract gulls, satisfactory viewing in the Tullytown area can be problematic due to access control and security issues. Access to the landfills and most of the adjacent ponds (including the Van Sciver Lakes) is pretty much out of the question unless you become a member of Waste Management’s Penn Warner Club. However, there are a couple of publicly accessible sites that can provide good views of loafing and bathing gulls. Both of these can be located easily using the search function on Google Maps. One is Franklin Cove, an outpocket of the Delaware River tucked in between an industrial strip in the town of Tullytown and one of the giant mountains of trash on Waste Management property. Only a few years ago, a nice loafing flock of several thousand gulls could be expected on the grass at Franklin Cove in the winter months– since the landfill site immediately adjacent to the cove is now inactive and trash dumping has primarily moved a bit north to the G.R.O.W.S. sites, fewer gulls use the cove now, though it is still a viable option and often holds a few hundred loafing gulls (and is also good for Great Cormorants). The far better choice for secure and legal gull viewing in the Tullytown area is the Falls Township Community Park. Here, thousands of gulls cycle through the ponds to bathe and loaf on the shore or on the adjacent sports fields. Today there were in excess of 7,000 large gulls on the soccer fields at the park, with lots of turnover through the middle of the day. A scope is useful since large flocks of gulls, like most birds, are not terribly approachable when they are resting. Herring, Great Black-backed, and Ring-billed Gulls make up the vast majority of the Tullytown gulls through the winter, though large flocks of Laughing Gulls can also accumulate during the warmer months. Lesser Black-backed Gulls are plentiful, as Bucks County is one of a few North American strongholds of this Old World gull (counts of 400+ have been recorded on lakes in the northern part of the county). Today I saw at least 65 Lesser Black-backed Gulls around various spots in Tullytown, and I only scanned a small fraction of the birds present in the area. Iceland and Glaucous Gulls are always present in small numbers in winter, though Icelands usually outnumber Glaucous (often a ratio of greater than 5:1 Iceland: Glaucous). Today I saw 4 “Kumlien’s” Iceland Gulls and 1 Glaucous Gull – numbers of these Arctic “white-winged” gulls should continue to grow through the winter. Thayer’s Gull is also annual, but is much rarer than Iceland Gull and should be diligently documented if encountered. Several nice gull rarities have been recorded around Tullytown, including California and Slaty-backed Gull, and this site is highly likely to produce one of the next species for the PA state list (I predict these will include Glaucous-winged Gull and Black-tailed Gull). Hybrids are fairly regular, and a concerted gulling effort will often turn up several hybrid gulls in a single day. The most commonly encountered hybrids in the area are Glaucous x Herring (or “Nelson’s” Gull) and Lesser Black-backed x Herring. Today I saw two different presumed Lesser Black-backed x Herring Gull hybrids at Falls Township Community Park – a photo of one is below. With Lesser Black-backed Gulls expanding their population explosively in the last half-century (accompanied with a large breeding range expansion in Europe extending west to Greenland), I think we can expect to see more individuals of this hybrid combination in coming years. Though it is unknown if the “Herring” parents of these hybrids represent American/ Smithsonian Gulls or European Herring Gulls, I think it is overwhelmingly likely that they are of American origin. Gulls can be enjoyed by all types of birders, but they almost certainly will help take your skill to another level if you are persistent (or you might just get a headache and go home to watch football). One of the greatest lessons I’ve learned while birding was taught to me by Herring Gulls – individuals within a single species can show DRAMATIC variation. Learning the variation within a common species can really enlighten more complicated identification problems. Good luck! The large gull at center is likely to be a Herring x Lesser Black-backed Gull hybrid. Actually, I'm fairly certain that's what it is, but it is usually prudent to hedge visual-only identifications of hybrid birds with words such as "presumed" and "probable" because of the imprecision of visual diagnosis of hybrids. The bird had upperparts that were intermediate in shade between Smithsonian/ American Herring Gull and Lesser Black-backed Gull, fleshy yellow legs, and intermediate body shape between the two suspected parent species. This pigment-challenged (check out Tony Leukering's article elsewhere on this blog to figure out the correct terminology) Ring-billed Gull was just south of Tullytown in Bristol today. "Kumlien's" Iceland Gulls are an expected treat in the greater Tullytown area - most are first cycle birds such as this individual, which is typical for a site near the southern edge of an Arctic gull's wintering range. The bulk of the adult age classes typically don't migrate as far south - sites in the northern Great Lakes, New England, and maritime Canada see many more adult Icelands than we get in the Delaware Valley. While on the subject of feeders, the White-winged Dove put in a more-than-five-minute showing at the Northwood Center this afternoon, so maybe it'll settle for more folks to come and see it during the week. Other news includes the Ross's Goose still with Canada Geese along Route 47 by the Bayside Prison in Cumberland County (but don't stop on 47 near the prison!). 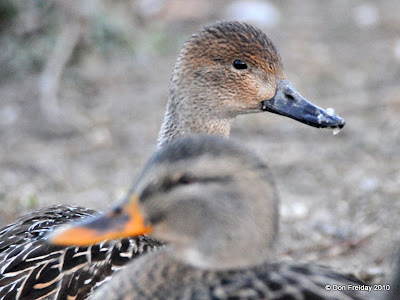 Sam Galick reported good duck numbers on Lighthouse Pond at Cape May Point State Park including five Blue-winged Teal. Today's a day for watching the backyard feeders; it's chilly out (though not too cold) and damp, gray and overcast, a bit breezy. Neh, I think I'll stay in and drink plenty of tea (OK, that's a British thing!). So just how much birding can you do if you fill up the feeders and wait to see what turns up? Well, my day started with the feeders at home and thoughts running through my head that I really wasn't sure how much money I wanted to continue to spend on feeding the 45 or so House Sparrows that dominate our yard! With nothing much else to look at for a while, I started pondering this female House Sparrow (photo above). House Sparrows are actually quite attractive if you can think beyond bright colors for a moment and look at the intricacies of more subtle feather markings. The pale 'tramlines' or 'braces' down the back, the dark-centered greater coverts and tertials with their neat pale fringes... It's all rather attractive and all classic female House Sparrow; but then suddenly we find ourselves moving into one of the most important parts of bird identification and recognition, which is - know your common birds! Stare at your regular feeder birds from every angle, from every which way until you know them standing on your head - then you'll be ready when the oddball shows up. Common birds may be our bread and butter birding, but pretty much all of us get fired up when something unusual turns up - and it chose our feeder too! Take another look - another much closer look at the bird above and check it out in your bird guide. Are those narrow, dark streaks on the sides? Isn't that tail shape a little weird - a little too long, a little too forked and pointed? Should a female House Sparrow be slightly rusty on the median wing coverts like that? And is that subtle streaking I see on the crown? Is that right for House Sparrow? OK, I gotta go to work now, so scroll to the end of this post for another picture of this same bird! Another location, another feeder! The most obvious thing about feeders is that they attract birds; and if we are honest, that's why we feed them, so that we can see lots of them and see them well. Birds don't need garden feeders, but it's a nice way to help them along a little during the tougher times of year. Birds were around an aweful long time and did jolly well before feeders were invented, so don't feel that you have to feed the birds, but know that they certainly appreciate it if you do! So, feeders attract birds; they attract birds in higher than usual concentrations - as will any rich food source, at least temporarily until the food is used up. And of course, as is so often the way in nature, there's a plus and minus at play here. First the pluses - for the birds, extra food. For us, a great opportunity to see birds close up and personal and to study them so that we may understand them better (or simply to appreciate them of course). New World sparrows give many people much grief and ripping up of field guides and swearing that we'll never look at another little brown job again! At present, up to 14 Fox Sparrows are at the Northwood Center feeders (see above photo), giving a great opportunity to study this beautiful species that is just a winter visitor here in New Jersey. And you can hear them singing too, which is wonderful. You can also see them side-by-side at feeders with other sparrows such as White-crowned, White-throated and Song Sparrows, giving a great opportunity to get to know them and understand how to identify them. Last Thursday, a single American Tree Sparrow also stopped in at the Northwood feeders so you need to be ever vigilant, whenever you can find the time. 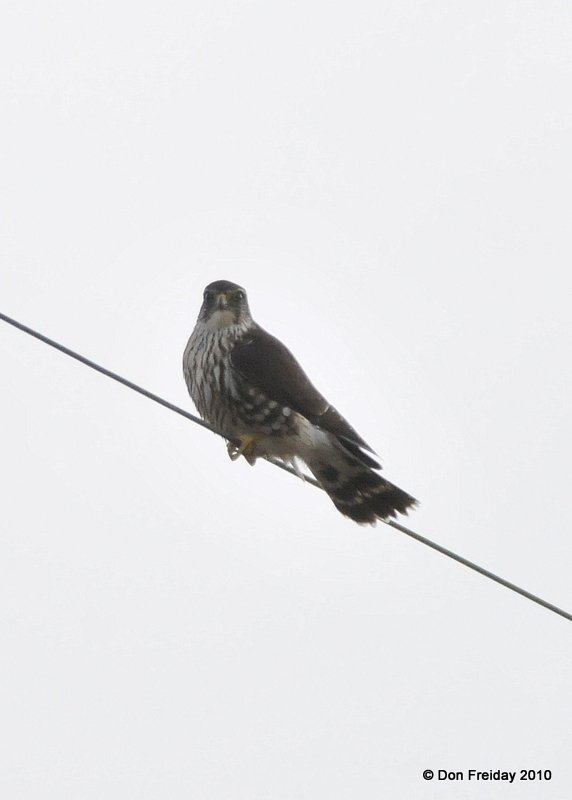 Well, as I said, feeders attract birds and this fabulous male Sharp-shinned Hawk is a bird! Sharpies eat birds; just birds; and male Sharpies are not very big, so they mostly eat those little ones that come to our feeders. This, with our human emotions added to the fray, is sad of course - even wrong in some people's minds. But we must remember that it is the natural way of things and Sharpies survive by being smart. Indeed most things survive by being smarter than their lunch - hey, even I'm smarter than a tub of peanut butter (probably anyway)!! But remember that, in the natural world, other forces are at play; the most important being that Sharp-shinned Hawks are not going to eat all of your yard birds - if they did, they would die out; it's a nice simple system. So we can either choose to enjoy Sharpies for those brief moments when we get fabulous views like the one above (which was right at the Northwood feeders today), or we can simply make it tough for them so that they go elsewhere. Hang your feeders where the predators can't get a good flight line through, make sure there is plenty of cover for the songbirds to hide in between feeding boughts; all that kind of thing. And as a double whammy - this young Red-tailed Hawk has been watching both me and the feeders while I've been typing this blog post - but I suspect he's got his eye on one of the squirrels if he can just work out how to do it!